Got a new sweatshirt yet? Before I keep going with this whole sweats trend thing, let me go on record by saying it’s perfectly cool to just wear your sweatshirt with jeans or whatever. Some days it’s best to keep things simple right? Part two here is pretty simple as well. Imagine your sweatshirt is a sweater. Get dressed accordingly. My favorite is the button down under the sweatshirt. 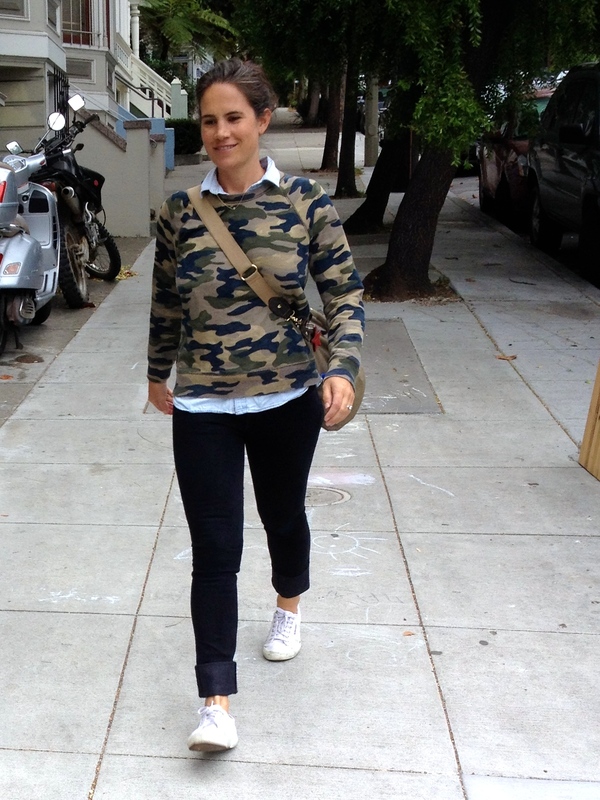 It just looks fresh and elevates the sweatshirt a bit while still keeping things casual. I mean how cute is this Spanish blogger in her quilted sweatshirt? This image has been all over my Pinterest feed. 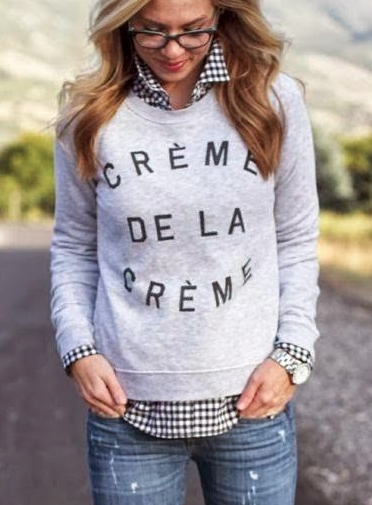 A simple black gingham shirt is on my wish list but any printed shirt (stripe, floral, plaid, polka!) as long as the sweatshirt on top doesn’t get too busy. Along the lines of Part 1, a skirt is a great option and some combinations might even be office worthy. I think a plain sweatshirt would look super cute with a big necklace. Maybe some heels with that for a night out? This image is J.Crew. The print mix here makes this ensemble particularly adorable but any sweatshirt would look great under a blazer. A cozy fall look with boots and a scarf too. As we really start to get into fall (at least according to the calendar — we’ve had a heat wave this weekend in San Francisco! ), I’ve noticed lots of cute new arrivals in the sweatshirt department. Like this one. Also, apparently, Meryl Streep wore a sweatshirt to a red carpet event. So we’re really on to something here! This is the season of the sweatshirt. And the sweatpants. Hooray! No, wait — stop — I need to clarify, this is not permission to pull out your sweatpants from college (no, of course you don’t still have those. neither do i…) and start strutting around. Like so many fashion trends, sweats are back but they’re a little different. The trend is very much about the simple crew neck sweatshirt in gray. Check out any store and you will see that Rocky staple for sale. It’s a great choice, despite the trendiness, as it’s classic and versatile. Sometimes it’s best to stick with the real deal. There are also great graphic choices – varsity letters, all over prints, florals, quilting, etc. Regardless it’s all about how you wear them which is nice as perhaps you can still wear your old standbys. The look is about balance. A little sweat mixed with something unexpected and more “formal.” Maybe you skip the sneakers and opt for oxfords or pointy toe flats. Maybe you wear a button down shirt instead of a tee. Maybe you even go for a skirt and heels. I love this look from Atlantic Pacific — she made that wonderfully ridiculous Poodle sweatshirt look so adorable! Last week, I spotted a woman in my neighborhood wearing a sweatshirt with a flirty floral skirt and it was such a cute combination — a great translation of Bee’s look that’s more practical for a busy mom. You could wear it to the playground with sneakers (hi-tops perhaps? ), polish it up with tights and boots, or even wear it to a casual office with a pencil skirt and pumps. 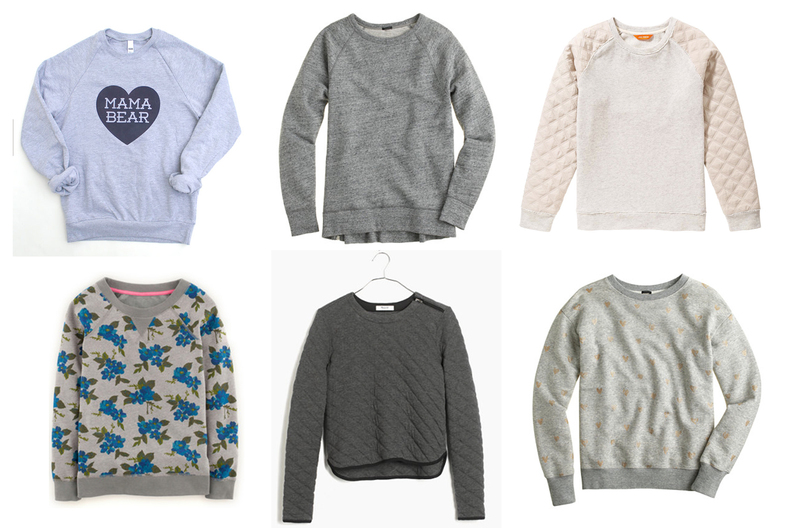 The sweatshirts at Everlane are really simple and clean – perfect for dressing up. Modcloth had a lot of fun/funny sweatshirts (I love this one) and Etsy is full of unique, artsy options too. Finally, I love this look from Hanna Andersen. Who doesn’t want to look like that? Can it possibly be fall already? What am I doing this morning? Spending WAY too much time checking out the new “autumn” arrivals at Boden. There’s so much cuteness! These would make great mom-fits (mom outfits!) don’t you think? 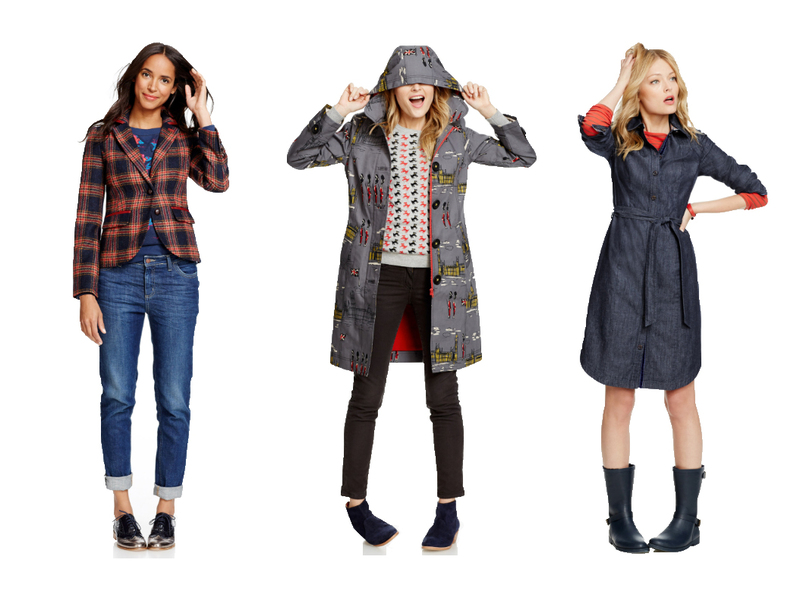 I love the layers and the fun prints – super cheerful for gray days this fall. As anyone who’s ever received their catalog will say, they make adorable kids clothes. I’ve loved the things Houlton’s had in the past couple of years and the quality is nice enough that Chester will be wearing his hand-me-downs. For some reason, before I had kids I was always a little reluctant to try the women’s things even though I often admired them. Once I stopped working in an office every day, I realized that cute, machine washable clothing is hard to find. Enter Boden. So many of their things are machine wash (often hang dry but you can’t have it all) including sweaters, blouses, and dresses. This fall I’m looking for easy but interesting tops — the kind of thing that makes a quick, cute outfit with jeans or cords. In my cart? This, this, and this (dog motif, duh). And since I’ve officially become an Anglophile, I’m debating on which of their London lovelies to add to my closet (like this soldier sweater).